What Can Cause a Lack of Digestive Enzymes? Eating an enzyme-poor diet for example processed fast foods, snacks and meals. As we get older our enzyme production gets less efficient. What Can Happen if Digestive Enzyme Levels are Low? Partially digested food can putrefy and ferment in the large intestine. Toxins can build up in the body. Nutrients in food will not be fully extracted. Symptoms such as bloating, stomach ache, excessive flatulence and indigestion may occur. How Can I Help My Digestive Enzyme Levels? Eat more enzyme rich foods: specifically living foods such as sprouts (of the bean variety), raw vegetables and fruit. Where possible avoid foods like meat and dairy. 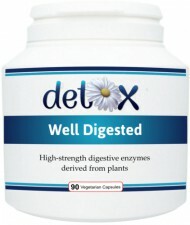 Take a high quality digestive enzymes supplement derived from plant sources. Also contains peppermint, ginger, apple cider vinega, bromelain and other natural digestives. Make sure you are well hydrated as dehydration can impair digestion. For more information have a look at my blog. Try basic food combining i.e. fruit only on an empty stomach and don't eat protein and starches together (so if you have meat just have veg and no bread or potatoes). Drink a pint of warm water with the juice of half a lemon half an hour before meals. Use raw organic apple cider vinegar to make dressings.